Designer Georgia Bosson studied Embroidery at Manchester University. In 2013 she set up the Georgia Bosson studio in Bermondsey where she started to experiment with screen printing and quickly developed her own signature style characterised by geometric designs and bright colours. 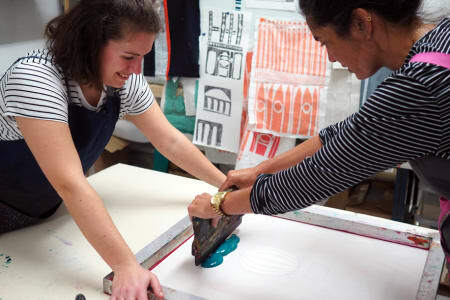 All of Georgia's designs start their life as paper cut stencils which when transferred to cloth come to life, she decided to share the excitement that the screen printing process can bring and in 2016 set up a series of workshops teaching others how to translate their ideas onto fabric and mix the perfect colour! In the past Georgia has run workshops at a variety of venues from Ikea to more intimate classes in her studio. Classes are available at locations accross London and vary from 2.5 hours to a full day experience. Great workshop. Small group so lot of personal attention. Coffee, tea, and lunch were provided as well as a delicious cake! 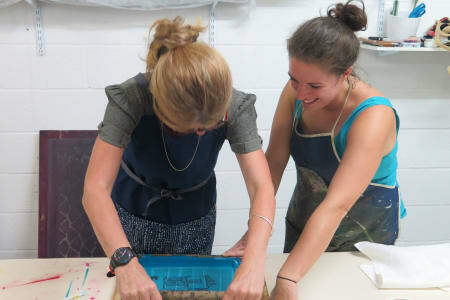 The workshop focuses on creating your own design and printing that on textile. Georgia then uses your design to create a pillow that will be delivered to your home! Sadly was unable to attend but would love to be able to. 5 star for refunding me, very much appreciated. I had a fantastic day in the expert hands of Georgia at her Bermondsey studio. 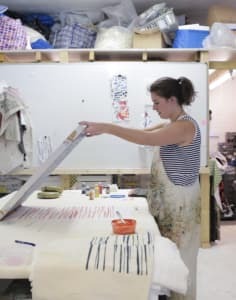 She explained the screen-print process in a simple way that make it far less daunting for the novices amongst us who had not done anything like this before. We were taken though the various stages and allowed to develop our ideas with Georgia's expert assistance. 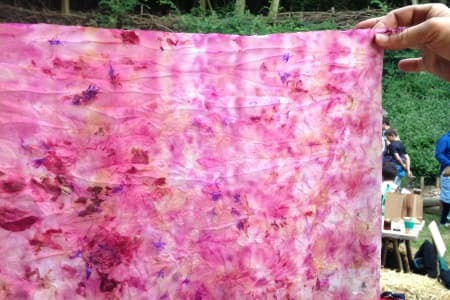 We then practiced with a simple print, enabling colours to be chosen and a feel for the process to be gained. There was plenty of tea and coffee and a tasty lunch mid way through the day before moving on to the real business of printing the final design. We all surprised ourselves by producing great work and have a wonderful screen printed cushion to keep as a reminder of a fun day. Georgia went to great effort to make the workshop an enjoyable day for all attendees. She was extremely generous with her knowledge and skills, encouraging us to explore our ideas. Left with an enthusiasm for screen printing which I can now pursue thanks to Georgia providing details of how to go about it. The design I printed was made into a beautiful cushion by Georgia and I received a few days after the workshop. It is a wonderful working studio, I loved being able to see the creative space where Georgia and her colleagues create and run their businesses from. Once we had all arrived Georgia took time to explain the process of screen printing and showing us books of inspiration before we started to work on our designs. We then cut out our stencils and choose colours before going on to to printing our designs. Georgia helps you along the way being both patient and encouraging. The lunch was yummy too! I loved receiving my cushion in the post about a week after the class, it is so exciting seeing the finished item now in my home. Awesome class. Georgia is extremely talented and a fantastic tutor.Loads of designs for inspiration, a hands-on practical class - but much easier than expected!Highly recommend. A great way to spend a morning. Great workshop ! Georgia was friendly, knowledgeable and gave really good clear instructions and advice. The studio was a lovely place to get creative too.Highly recommended! Georgia was wonderful! such a great teacher. It was a lovely relaxed and supportive environment - we have a great time!